It was announced this weekend that NPR will have to cancel their new News program The Bryant Park Project for cost reasons. The NYT story is here. The BPP site with comments on the closing of the show is here. You can see that I was not the only fan nor am I the only one who is upset! Laura called me this morning for an interview on how I felt. Obviously I am very sad. But she also asked me for what I thought might be some reasons. It is only day 1 - but I do have some ideas. They are only mine and they are my immediate reactions. As I have promoted the show and its apporach to the web so much, I think that I owe you some reasons as well. I think a couple of things are becoming more clear to me. The show was seen as a Radio show with a strong social web element. This is I think the key error that drove the costs and the expectations. If you want to do the new today - you have to break away from the costs of the machine - if a paper, no press and no paper! I would have launched BPP as a web show with a bit of radio. No small distinction. So much of what BPP did on the web - the use of Twitter to build community - the use of Facebook to give us a weekly review. The use of video on the blog. All this broke down the barriers of power/distance and time. Many of us felt part of the show. Our ideas were heard and acted upon. We even went on the show now and then. A lot of what pulled us in was the personal. We learned about the food obsessions, the drilling, we chatted 24/7 with the staff and with each other. We met and made new friends. The NYT mentioned that in April and May they had a million unique visitors on the web. This is brilliant. As a web based show you can build the audience until you have enough momentum to add more radio. I would also have made it easy for "members" to donate to BPP. What about the stations? I would have had a split. Try the new economics for real all the way. So what went wrong? The show was conceived as Radio! In St Louis, many of the best staff of the Dispatch left the paper and started a new one. The one thing they did not consider was using paper! This is a picture of the pride of the RN in 1860. Called HMS Inflexible, she looks modern. She has a "website". She is made of steel. She is driven by steam. She has big guns in turrets. But she was not modern. Because, she was set up to fight as Nelson's wooden ships were. The culture was to engage closely. The culture was that those dirty engineers had to stay away from command roles. 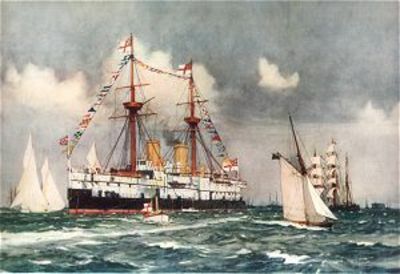 HMS Inflexible was a hybrid. Looked new but was in reality based on the rules and the culture of 1805. 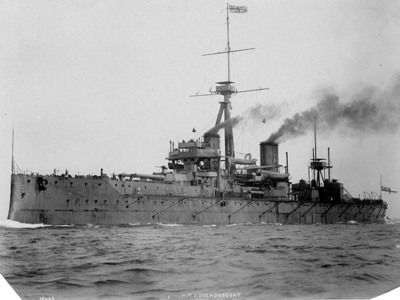 This is HMS Dreadnought. Launched in 1906, she was the complete vision of the new in its reality. She was designed to fight at 10 miles. She was designed to be led by people who understood engineering. She had the power to sink the entire German Fleet at the time. In launching her, Admiral Fisher knew that he had made all the RN's fleet of Hybrids obsolete overnight. But he could not afford not to go to the new. His concern was that Germany or America would beat him to it. I think that this where we are in media on this sad July morning. It's all the way or not at all. Just as the presses and the paper is a cost that is killing the Newspapers, so the transmitters are killing TV and Radio. All that can remain for a while are the established shows such as ME and ATC. But if you want some thing new that will scale and make you money - it's the web all the way. Look back at what BPP did so well there and know that they paved the way for you.